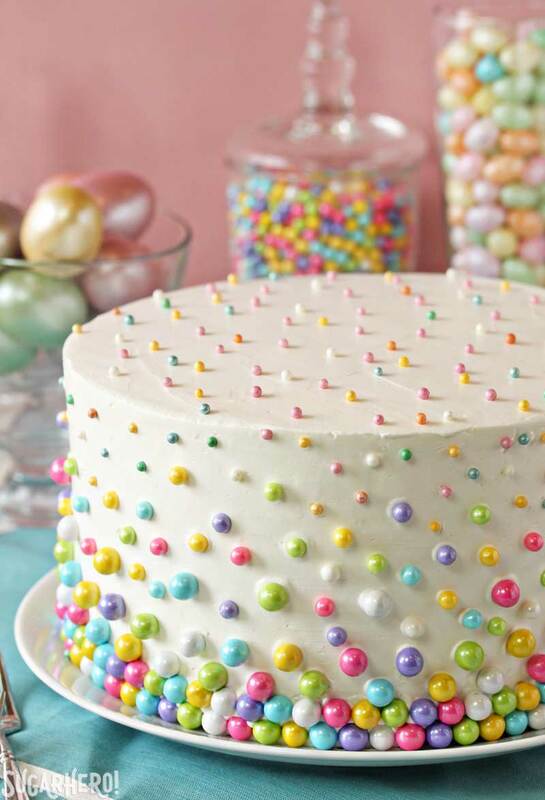 This Easter Polka Dot Cake is a gorgeous spring cake with polka dots on both the outside AND inside of the cake! 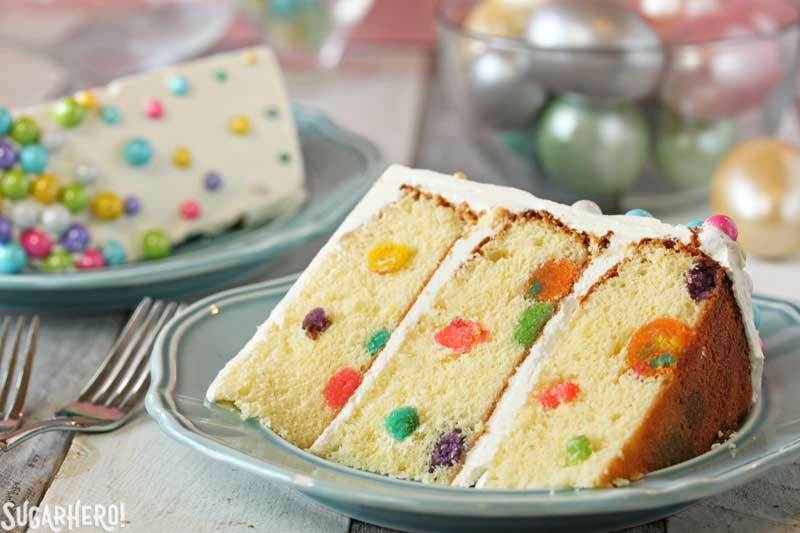 Learn how to create this cute, easy cake with surprise polka dots inside. What was she going to say? Beautiful? Gorgeous? Stunning beyond measure? My mom does not lie—many things that I make and post here are time consuming. Let’s be honest about this. I’m no Rachael Ray, and very few of my recipes could be described as quick or easy. This is something I think about frequently, both because it causes me to be working in my kitchen at unholy hours of the night, and because I’m aware that fast and easy foods are the flavor du jour. We live in a Pinterest world, and that means few ingredients, minimal steps, and instant gratification. Basically, the exact opposite of everything I make. On one hand, I want to give the people what they want. Of course. What good is a recipe blog if no one ever makes the recipes? On the other hand, what’s the point of having a personal blog if you’re writing to popular opinion and not your own tastes? I go back and forth on this issue on a weekly basis, but what it usually comes down to is the fact that I can’t bring myself to make and post things that I’m not really, really excited about. And what excites me most are semi-ridiculous things like are sky-high mousse desserts, homemade stuffed doughnuts, eight layer cakes, and swirled tarts topped with whipped cream and chocolate curls and homemade truffles. In my world, more is more, and I just need to own it. If people pass by my recipes in favor of ones made with a cake mix*, well, that’s the way the overly complicated cookie crumbles. *I should point out that this particular recipe does make use of a cake mix, though, so y’all should come back here right now! Now that I’ve effectively talked you out of ever making one of my recipes, let me sell you on this polka dot cake. I won’t tell you it’s fast, because I like you too much to ever lie to your face. But I pinky-swear to you that it truly is easy. 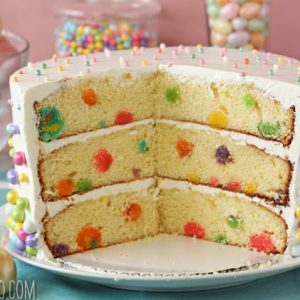 The polka dot pattern on the outside is made by pressing candy into frosting, which requires zero planning and very little thought. The polka dots on the inside start as mini cake balls, which every single person on this planet and a few intelligent apes have probably made by now. Cake + frosting + rolling = instant cake balls! The cake balls are suspended in yellow cake batter before being baked, which again doesn’t take many brain cells. Both aspects are simple on their own, but when you combine them, you end up with a whimsical cake with a super-fun surprise inside. 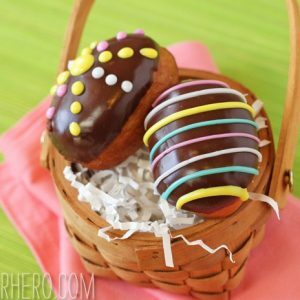 To make this even more Easter-appropriate, you could roll your cake balls into egg shapes, and decorate the outside with an Easter egg pattern. You might be able to see in some of the pictures that I got a little ambitious and tried to make multi-colored cake balls with stripes or dots inside. It worked, but I didn’t think the effect actually looked very appetizing, so I abandoned the idea–but you could certainly experiment with combining colors to form cool patterns! The cake itself is a lemon cake with coconut buttercream, so it tastes light and springy. It’s the perfect way to end a special Easter dinner, or you can use this technique to make any special occasion cake. Birthdays, anniversaries, and major holidays all call for surprise polka dots, in my opinion. And don’t worry, this story with my mom has a happy ending. To punish her for her brutal honesty, I served her a big slice of this cake that as soon as I was done taking pictures. That’ll show her. 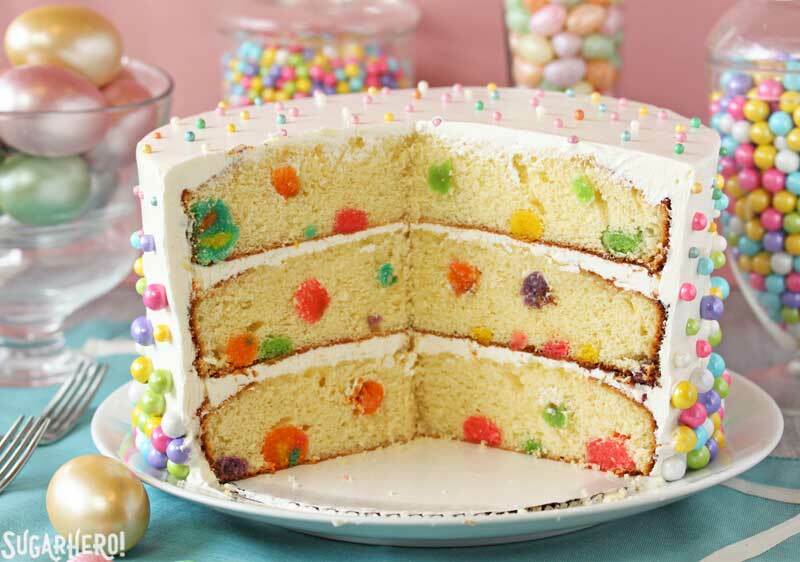 This Easter Polka Dot Cake is truly easy to make, don't let it's look be deceptive! Just combine a few simple steps and you'll end up with this beautifully whimsical cake. Preheat the oven to 350 F. Prepare the box mix according to the package directions. Divide the batter between five or six small bowls. Add a small amount of food coloring to each bowl to make different pastel shades. Scrape the colors into small cake pans, pie tins, or other small oven-safe containers. Bake until a toothpick inserted into the center comes out clean and the top springs back when lightly pressed. The baking time will vary depending on how much batter you use and the size of the pan, so watch the cakes carefully and start checking for doneness after 10-15 minutes of baking. After the cakes are baked, let them cool completely. Crumble the cooled cakes into separate small bowls, then add a spoonful or two of frosting to each bowl. Work the frosting and cake together with your fingertips until the cake is moistened and holds its shape when rolled into a ball. (If you have ever made cake balls before, you are looking for the same texture as cake balls.) If necessary, add more frosting until you get a consistency that's easy to work with, but stop adding frosting before the cake gets greasy or gummy. Roll the cake into small balls of different sizes, and place them on a wax paper-covered baking sheet. Cover the sheet with cling wrap and keep it in the refrigerator until you're ready to make your cake layers. The polka dots can be made up to a week in advance, and kept in the refrigerator or freezer until ready to use. Preheat the oven to 350 F. Line three 9x2-inch cake pans with parchment paper, and spray them with nonstick cooking spray. Combine the yolks, 1/2 cup of milk, and lemon extract in a small bowl, and whisk gently to combine. Set aside for now. Combine the lemon zest and sugar in the bowl of a large stand mixer, and rub them together with your fingers until the sugar is moist and fragrant. Add the flour, baking powder, and salt, and mix together with a paddle attachment on low speed for 30 seconds. 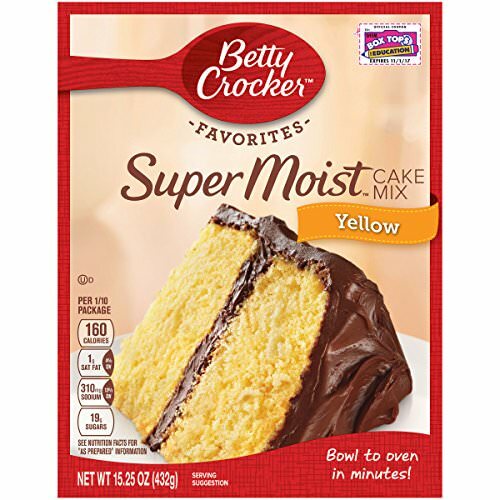 Add the room temperature butter and the remaining 1 cup of milk to the flour, and mix on low speed for 30 seconds, until the dry ingredients are moistened. Turn the speed up to medium and mix for 90 seconds. With the mixer running on medium-low, add the egg yolks in three batches, mixing for 30 seconds after each addition. At the end, stop the mixer and scrape down the bottom and sides with a spatula so that the batter is well-mixed. Divide the batter evenly between the three cake pans. Take the cake balls and press them into the batter, pressing some all the way to the bottom, some into the middle, and leaving some on top. You don't have to use all of the cake balls, but do use a lot of them—it takes a surprising amount of polka dots to make the cake slices look well-dotted! Bake the cakes at 350 F for about 25 minutes, until they're puffed and golden on top, and a toothpick inserted into the center comes out with just a few moist crumbs attached. Cool the cakes completely. Beat the whites on medium-high speed until they are no longer warm to the touch—feel the outside of the bowl, and make sure that it is around room temperature. Depending on your mixer and the temperature of your environment, this may take 15-20 minutes, or more. Reduce the speed to medium-low and add the softened but cool butter in small chunks, a tablespoon at a time, making sure to wait in between additions. It may separate or look a little gloopy at this point—fear not. Once all of the butter is added, increase the speed again and whip until it comes together and is light and fluffy. If, after 5 minutes, it hasn’t come together, refrigerate the mixing bowl for 5-7 minutes, to cool the mixture down, and whip it again. Add the salt and 2 tsp coconut extract, and mix until well-blended. Taste the frosting and add more coconut flavoring if desired. The buttercream can be made in advance and kept at room temperature if you’re going to use it the same day, or refrigerated. If it’s been chilled, let it sit at room temperature until it softens, then re-whip it to get the fluffy texture back before you use it. Trim the tops of the cakes so that they are level. Place one cake layer on a cake cardboard (ideally) or a plate. Spread a generous cup of frosting on top of the cake, extending out to the sides. Place a second cake layer on top of the first, and top that one with frosting as well. Finish with the third cake layer, then cover the sides and top of the cake with a thin layer of frosting, then refrigerate until firm. Once firm, spread the top and sides with the remaining frosting. To get a very smooth finish, I like to run very hot water over an offset metal spatula, wipe it dry, then slowly run it over the sides and top, rinsing frequently. The heat of the metal helps to smooth out the frosting. 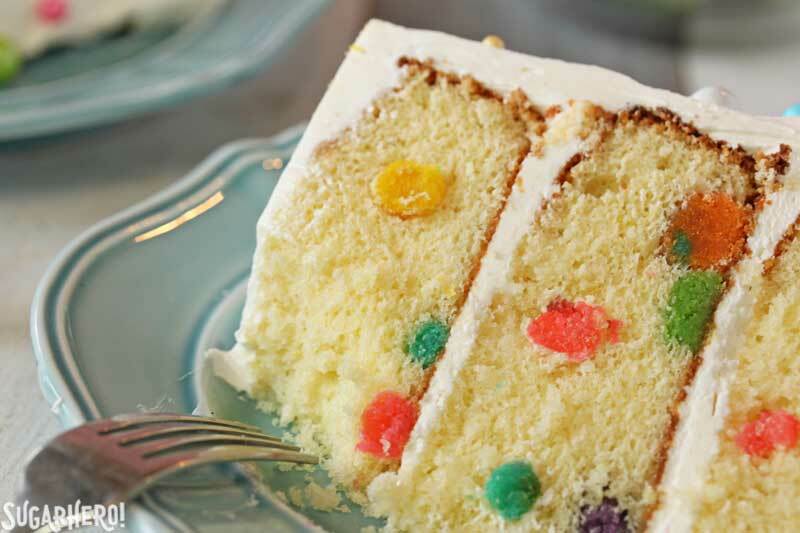 Finish the cake by pressing Sixlets, sugar pearls, or other sprinkles into the tops and sides of the cake. For the best taste and texture, serve this cake at room temperature. Ok I’m totally inspired! We’re having a “dalmatian” party for my son’s first birthday in a few weeks and I think I’m going to give this a go, in black and white of course. I’m having visions of all of my cake balls ending up on the bottom of the cake though…how do they stay suspended?! Is this cake mixture on the thicker side? Or is there some other kind of magic at work here?! 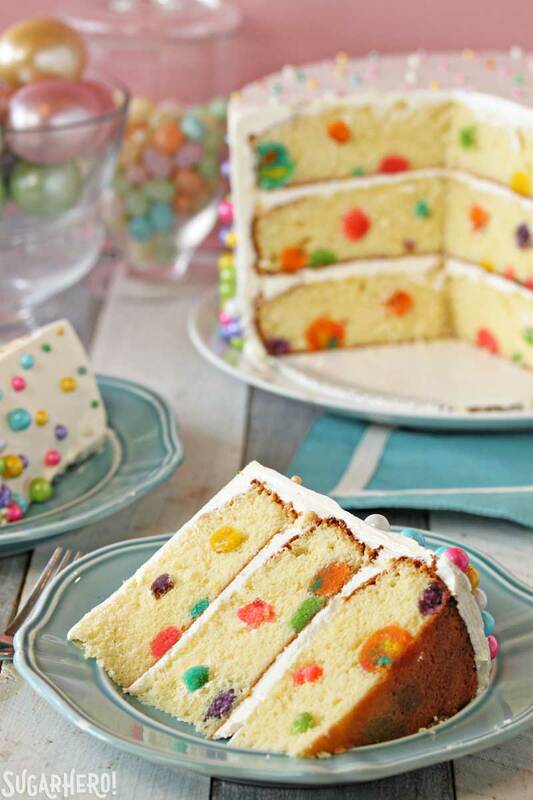 By far the best polka dot cake I’ve seen in all of my searching!!! Hi Annalisa, Apologies for the very late reply! The homemade cake batter is definitely on the thicker side (not thin and pourable like a cake mix) so there’s no trouble having the cake balls suspended in the batter. Hope the cake and party turn out wonderfully well! Hi Elizabeth. Thank you for sharing. I am in the midst of getting my ingredients out to make this lovely looking cake and fell upon some left over fondant. What do you think of the idea of molding this into balls instead of you polka dot recipe? did you have any problems with sticking the beads on to the cake? I absolutely LOVE this cake but I’m a little surprised at something. I would have thought FOR SURE the frosting in the cake balls (essentially cake pops) would have melted in the oven during their rebaking. You know, 10 years ago if someone would have asked me if cake could be baked, then placed inside of another cake to create a design I would have told them ABSOLUTELY NOT. I originally thought the second cake would have become dry, tough, something nasty so when the cakes first began to appear online in blogs and I finally learned the secret I was FLABBERGASTED to say the least. I finally found and bought one of the pans that makes the cake balls so I thought that’s what you did here until I read the instructions in detail. I’m still wondering why the frosting doesn’t melt. If you think about it scientifically it should by all accounts but I guess the cake batter protects it and the inside of the cake doesn’t get hot enough. Even though I’ve been baking from very little for 50+ years cake bakers still astound me every week. I tell people that from the time I began decorating cakes in the early 2000s until now the advancement in tools, “toys” as I call many of them, molds, stencils, edible glitters, gems, pearls, lace, and any other decoration you can imagine and ALL sorts of gizmos that make cake decorating a thousand times easier than it was when I was little and very young is overwhelming. I truthfully can’t keep up with it all. The “trends” in cake decorating are changing as fast as fashion trends do anymore and in fact, I believe fashion is having a huge impact on cake designs as well. One of my favorite cakes done by professionals are ones where the cake design is based on a runway style gown design. It’s amazing the interpretation that occurs. Keep up the good work on your cakes. I’m SO glad people like you are willing to spend the time creating items like this and sharing it with people like me who don’t have the artistic ability to think of these things. I’m a good baker, in fact I would go so far as to say most people who know me would say I’m a really GREAT baker of cakes, but my strength lies in baking the actual cake and the frosting and the fillings and putting it all together. I’m a detail person and that’s what a good baker needs to be. However, my brother got all the artistic talent in the family so I’m far better at copying ideas than creating them. If the world sat around waiting for me to come up with such lovely and adorable ideas as this cake, which if the colors are changed would be great at all sorts of functions, they would be waiting until the end of time most likely. That’s my favorite cake design, one that can be used for multiple events. Sometimes just the way they are and sometimes with just changing colors or other details. Thanks for all of your good work. 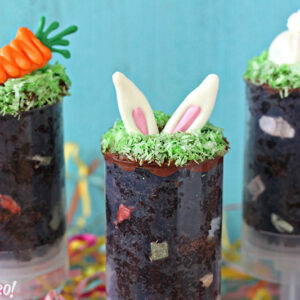 This recipe looks amazing, making it for my sons 6th birthday this weekend. What are you thoughts on using whipped cream over the buttercream? 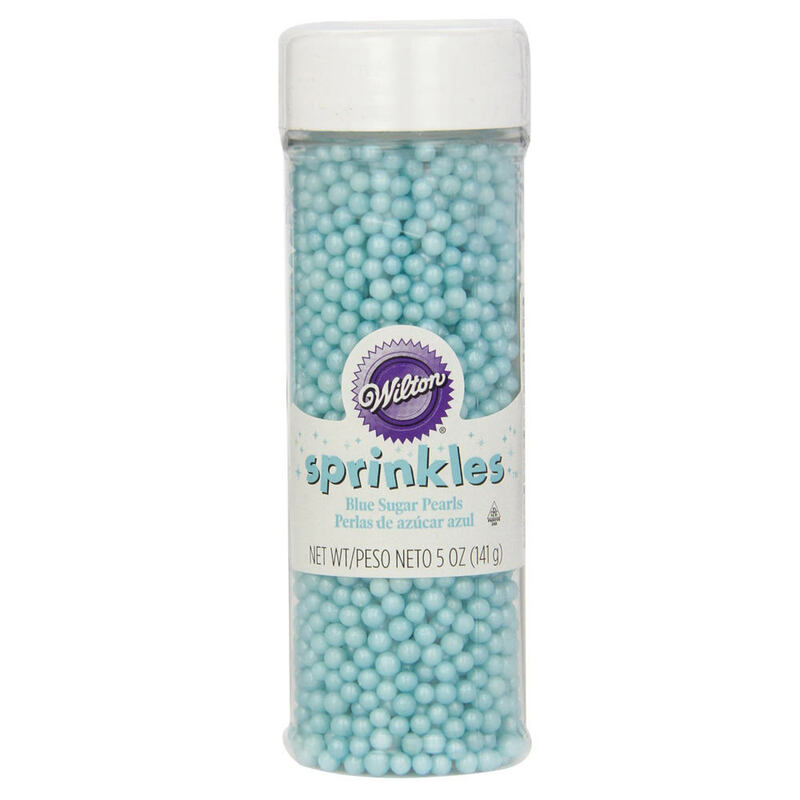 i purchased 1/4 dot sprinkles to decorate the cake along with the pearls. thought i’d use the pears on the top of the cake and the dot sprinkles along the sides. Do you think whipped cream with hold them in place? I’m planning to make this cake for my sons 6th birthday this weekend. He prefers whipped cream over buttercream. I purchased 1/4 dot sprinkles for the sides of the cake and pearls for the top. Do you this whipped cream can hold the dots if I put a stabilizer in the cream? I’m planning to make this cake for my sons 6th birthday this weekend. What are you thought about using whipped cream over butter cream? 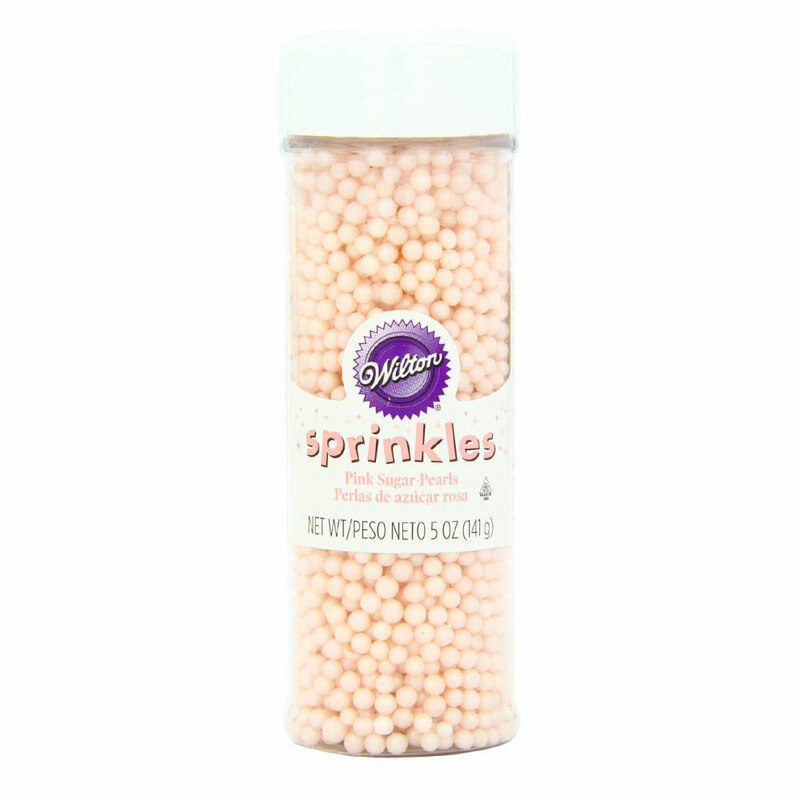 I bought 1/4 dot sprinkles for the sides, do you think whipped cream can hold them? Thank you! Yes, it definitely can be made ahead of time. I like to assembly my cakes when they are semi-frozen so that they are sturdy but have time to defrost before serving, because it is best at room temperature. Hope it goes well! Hello can you give me some help I made one of you cakes today The strawberry rhubarb shortcake and yes it was a challenge. With in an hour of finishing it the layers split and the cake collapsed. It was Like a mud slide OMG ……lucky it was a test cake for my mums 80th birthday party. How can I keep the layers of this cake breaking in the middle.? Please help…..
A VERY striking effect, Elizabeth ! Perfect for my next cake. I am searching for the candy “pearls” you used, but not finding exactly what I expected. It appears you have used three sizes of candy, yet they appear to be the same colors. Are they all from a single source? Who makes these and where did you purchase them, please. Thank you, Gary! 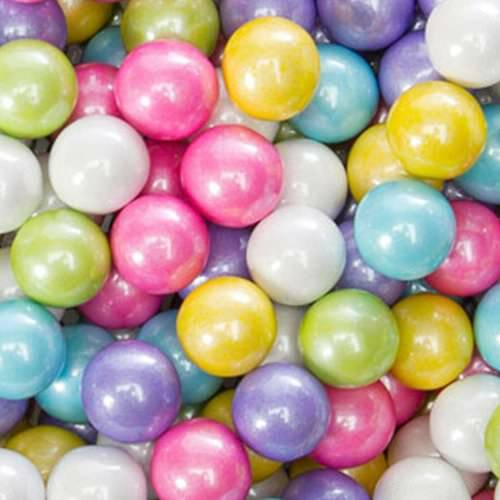 The two largest sizes are by SweetWorks, and they’re Sixlets and Celebration Pearls. Unfortunately, I’m not sure about the smallest size, and since its been 4 years since I made the cake I no longer remember the source of the smallest sprinkles. Apologies! I have found these at Walmart and also Jo/Anne’s Fabrics. I know I’ve seen at least two sizes. They are also sold in mixed colors or single colors which would let you chose a particular color scheme. I have found them at Paper Party Outlet as well(Columbus Ohio). I found the tiny ones at Meijer, I believe. Some of us do have time and love doing fun ‘wow’ stuff! So, keep being yourself, doing what you love to do! You are not alone! It is true. Your work takes a while to learn. 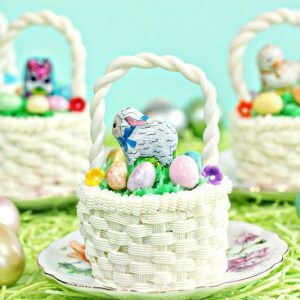 I made some marzipan eggs for Easter, and when I got to your instructions on chocolate, I was grateful that it isn’t usually used with the ingredients I chose. But, at least you got me thinking, and the eggs are a delicious representation of Florida, which I might never have attempted without your inspiration. Simple fondant was a good first step. Tempered chocolate, one day. 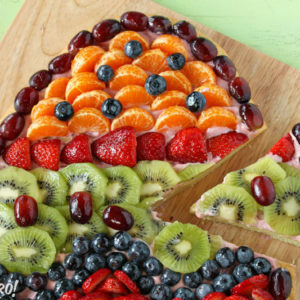 I from Brazil, i love cakes, so beautyful, delicious. Thank you so much, Maria! I appreciate it. Hey Juna, I am so excited! I would love to hear how it goes and see pictures! !